I'm back from my blogging break and happy to be here. Revising my verse novel took up more than half my time (I'll be back to talk about my novel and the Highlights Foundation workshop on Monday, July 11th). The rest of my blogging break was spent on a river cruise with my husband in Europe. Yes, I know, we're very lucky. Actually, you have no idea how lucky we are! at about 6:30 am local time on Father's Day, June 19, 2016. We all managed to keep our sense of humor about the situation. You may have seen the commercials. ("Unpack once and spend more time being there.") An idyllic river cruise through Germany, Austria, and Hungary to see Europe's greatest treasures. Well, two nights out of a planned seven were actually spent cruising. Then we were awakened at 3:30 am on the second night by a loud bang, the ship shuddered several times and eventually started listing to one side. My husband said, "I think we're in trouble." I said, "Relax, they know what they're doing. We're probably in a lock. Go back to sleep." Taken from our sliding glass door on the 2nd level at 3:54 am local time. We are parallel to the bridge and not going anywhere. But we never did go back to sleep. And we weren't in a lock. My husband understood right away that we were actually stuck next to a bridge. 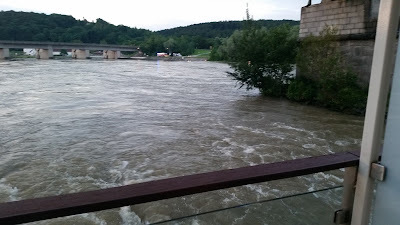 The muddy, churning water of the Danube River was rushing under the boat but we weren't moving. By 4:30 am, we'd been officially informed that the ship had run aground. By 5:30 we'd packed our luggage but left it in our stateroom as ordered, and even had time for a quick buffet breakfast on board the ship (I miss you, Chef Solomon!). By 6:30, we were taken off the vessel in small rescue boats by a local German fire rescue crew and taken to a small dock, then by bus to the fire hall, where the equivalent of the Red Cross handed out coffee, tea, and water. I can honestly say it's the first time I've ever had to be rescued from a ship that ran aground and the first time I've ever been taken to a fire hall for disaster relief. It was truly an adventure. I think having a sense of humor and a sense of adventure is the key here. 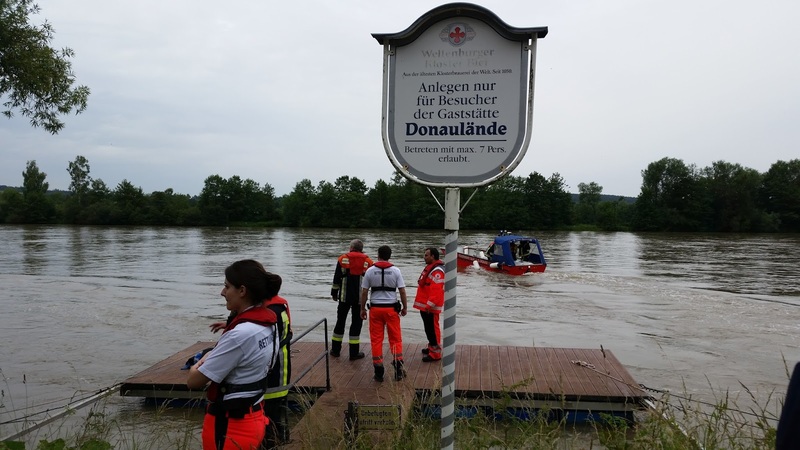 More importantly, no one was hurt, everyone on the ship stayed safe, and the volunteers of the Kelheim-Stadt Fire Rescue company were all very calm and thorough and professional. They did a fantastic job of getting 186 passengers and 50 crew members safely off the ship. Another view from our stateroom, around 6 am, just before we left it for good. 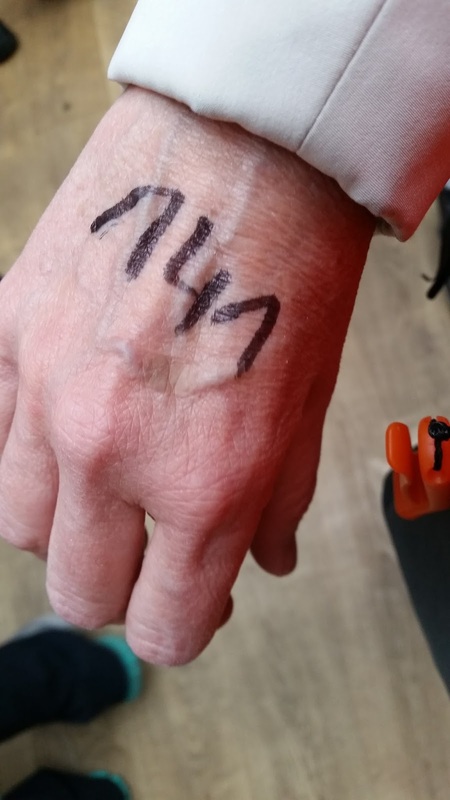 The volunteer fire rescue crew wrote numbers on our hands as we prepared to step into the rescue boat. Worlds Oldest Sausage Kitchen, Regensburg, Germany. The sausages were delicious and I don't even like sausage! St. Stephen's cathedral in Passau, Germany. We were treated to a magnificent organ concert. a 900-year-old working Benedictine abbey where they make a delightful apricot wine! This may look like a palace or cathedral but it's actually Parliament in Budapest. And Viking gave us a one-hour river cruise to see the lights come on Thursday evening. 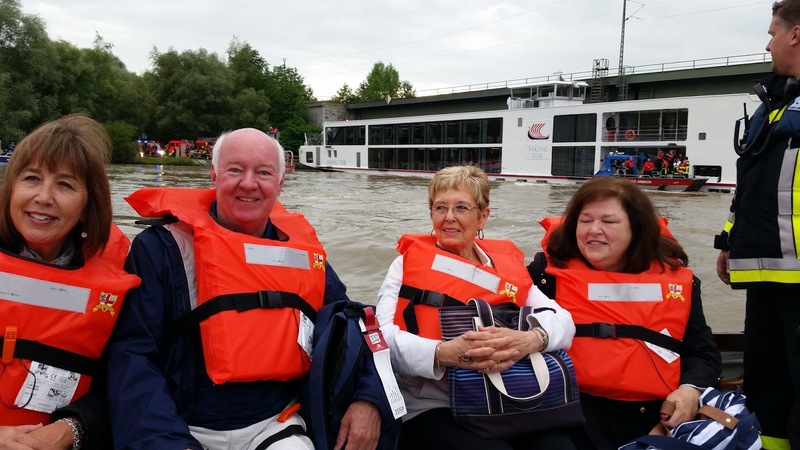 So we still got our Budapest river cruise. Thank you, Viking! Imagine finding hotel rooms for 190 people at short notice! And having to feed all those people. And bus them all to the next included excursion. How they managed, I'll never know. But we never missed a single city tour. So we still saw everything we were supposed to see, including an optional tour my husband and I had signed up for, to the Bavarian Village museum, also known as the Museumsdorf Bayerischer Wald, near Passau. A delightful journey into Bavaria's past, with over 100 authentic buildings brought in from all over Bavaria and preserved. as our group of 15 seemed to be the only people there that day! The accident was certainly not the worst thing that ever happened to us on vacation. Curious about the worst? See my "About Me" page. When something unexpected happens on vacation, how do you handle it? Do you keep your sense of humor? I'd like to wish all my American friends a very happy (and safe) Independence Day weekend. And to everyone, whether you're heading off to the beach or the mountains or to somewhere farther away for vacation, may all your travels be safe and uneventful! How lovely! And even though it's not as much fun to live through excitement, it leads to MUCH better stories! I'm more jealous of the Highlights foundation, though! Oh, it was a grand adventure, Karen. And yes, we'll be telling this story for years to come! Next week, I promise, I'll have Highlights Foundation details (I just got a little distracted by, you know, the rescue, lol.) And I hope you get to go there someday. It really is magical. So glad you and everyone else were safe. I would have been terrified. And glad you were able to have such a good vacation even with the adventure. My goodness what an adventure! It sounds like great material to work into a novel or story down the line. I'm glad you and your husband did get to see the cities you had planned on. Hats off to Viking for handling everything so well. Welcome back! I found it thrilling just reading about your adventure. Keeping a sense of humor is the most important thing in such situations, I agree. Glad you were all safe and sound, and that the tour continued albeit by bus. Can't wait to hear your Highlights tales later in the month! Oh good, Michael. I'm glad it was thrilling for you to read about. Living through it was definitely thrilling. There were a lot of jokes about the Titanic--and Gilligan's Island--among our little crew. You've got to have a sense of humor when life throws something like this at you. I have actually been on that very cruise, but we did it the old-fashioned way -- on the boat! Sorry this happened for you, but it's impressive how well it was handled and how well you went with the flow. I hope they've offered you big discounts on another cruise. It will be worth going. I hope to take another one day. The old-fashioned way -- HA! That's really nice, though, Rosi. Glad someone experienced the actual cruise. Yes, Viking was amazing. And we're getting a partial refund plus a huge discount on a future cruise. 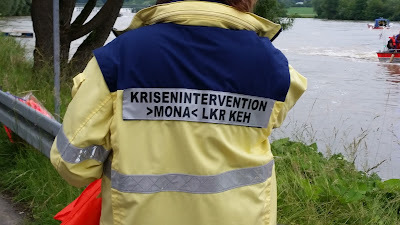 We've already done the Rhine (two years ago), so we haven't decided yet what we'll do next. I'm sorry your river cruise had to leave the river, but it seems as if it was quite an adventure, and I can't believe they managed to complete the tour without the boat! Oh, Dianne, it was definitely a grand adventure. We'll remember this one for a long time! Germany, Austria and Hungary are all close to each other and not that large (Austria, for instance, is the size of South Carolina), so they were able to bus us everywhere we needed to go. The only tour affected was the city tour of Budapest which took place in the afternoon instead of the morning because it took us three hours to get there from Vienna (normally you'd cruise overnight). So a few of the optional tours that day had to be canceled, but we hadn't signed up for those anyway. Lucky, I know. We've always thought those cruises sounded fun--but wow, you had a completely memorable experience. I'm sure this will be good story material. So glad you are safe--and can't wait to hear more about Highlights. Thanks, Jenni. They certainly do take wonderful care of you. If you're planning a river cruise someday, I'd suggest the Rhine cruise. We did that one two years ago and there was no flooding! Wow, Joanne! That really WAS a memorable vacation! Glad everyone was safe and that you were able to continue your vacation on land. Love the pictures. They are beautiful. A river cruise is definitely on our bucket list. Thanks, Alison. Hope you get to do a river cruise soon. And hope it goes smoothly! Happy 4th to you, too! I've had some traveling mishaps but nothing like that. Certainly memorable and I'm glad everything turned out fine. Thank you, Greg. Wishing you a fun and safe holiday. I'd imagine most travelers have tales of woe (lost luggage, missed connections, etc). Thanks, Erik! All told, it was an unforgettable vacation. I'm so glad you were safe and that you were able to visit all of the places you planned on! I think that we have to keep our sense of humor when the unexpected happens. Otherwise, we let the unexpected ruin our fun. :o) The only time I've ever been to Europe, I was going on vacation to a beach in Portugal with my cousins who lived in Switzerland. There was a little revolution going on in Portugal, so I had to keep my mouth shut while my cousin's wife talked revolutionaries into letting us through the blockades. She said that if the revolutionaries found out I was from the U. S., they'd hold us to help make their point. I was 14 and thought the whole thing was exciting. Haha. We ended up making it to our beach and took a different route to get back to Switzerland. If you need a reader for your novel in verse, I volunteer as tribute! I actually have two other critique partners who write (and have sold) MG novels in verse, and I enjoy critiquing them. I'd also be happy to swap chapter books if yours is ready. Thanks for offering! Myrna, I'm so sorry I'm just seeing this comment. And wow! That's quite a travel story you had yourself. I imagine a 14-year-old would find that exciting. There's a YA story there somewhere, right? You are too kind to offer to read my novel-in-verse. I'll email you. I love this adventure story. And the images, not only of the unexpected, but the lovely expected. I especially like it that the geese were eager to see you folks. All in all, a memorable journey! Brava! Thanks, Jan. So happy you enjoyed hearing about our adventures. And the geese were almost as much fun as the rest of the vacation! YAY for comments! I read and appreciate each one and I always try to answer. All opinions welcome. Let's have a conversation.